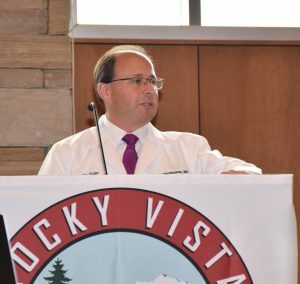 Rocky Vista University (RVU) welcomed its ninth class of medical students to its College of Osteopathic Medicine (RVUCOM). 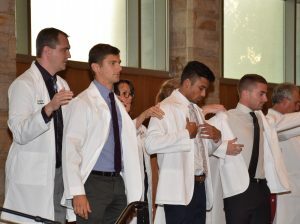 The students were officially matriculated into the school at the annual White Coat Ceremony, held at the Wilderness Experience in Parker, Colorado. 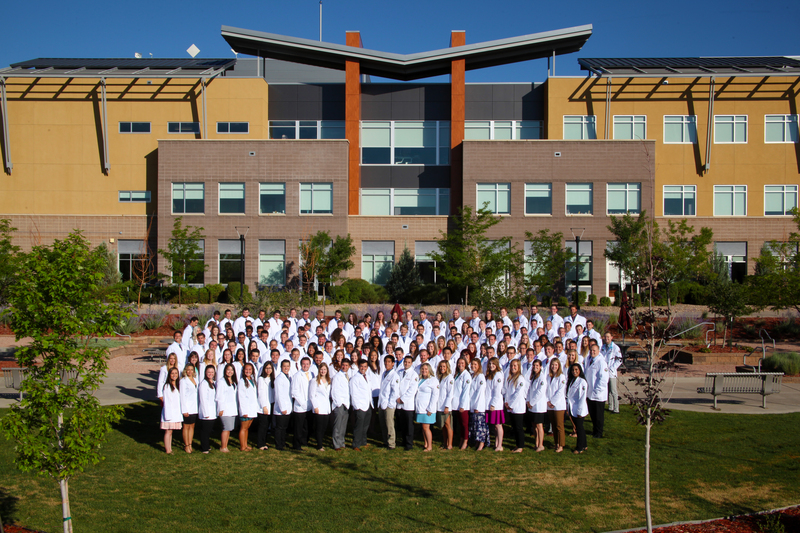 The White Coat Ceremony is a traditional way to welcome new students to their medical careers. The keynote speaker was David Markenson, MD, Vice President of Graduate Medical Education for the Continental, Mountain, and Mid-America Divisions of Hospital Corporation of America Physician Services Group. Additional speakers included Jibran Khan, OMS II, President of RVU’s Student Government Association; Clinton E. Adams, DO, FACHE, President and CEO of RVU; and Joel Dickerman, DO, Associate Dean of Clinical Affairs. 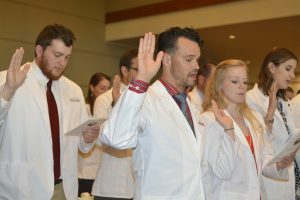 Upon being coated (the act of officially receiving their medical school white coats) by physician faculty members, the students were led by fellow classmates in reciting the vision statement that they, as a class, had written to express their goals and values for the next four years at RVUCOM. The Class of 2021 is comprised of 160 students from a variety of backgrounds and locations. The students were selected from an applicant pool of over 4,500 candidates. The ratio of men to women in the class is 103:57, while the age range is 21 to 37 years old. The average MCAT scores among the class were 28.03 for the previous version of the test and 504.7 for the new version. The average cumulative GPA for the incoming class was 3.58. In keeping with RVU’s continued support of military students, 11% of the incoming class are attending on the Armed Forces Health Professions Scholarship Program. Eight students matriculated after receiving RVU’s Master of Science in Biomedical Sciences degree, a nine-month graduate program to increase a student’s understanding of the health sciences, as part of the program’s Inaugural Class of 2017.